I've only had gnocchi twice in my life... the first was in our trip to Italy this past spring, and the second was at home, with some store bought gnocchi. I wasn't sure if I was brave enough to try making it by hand. When I came across this recipe in my latest issue of Clean Eating, it sounded too easy to pass up! It definitely was not hard to make, but it was time consuming. I ended up cooking all the gnocchi and we ate this for lunch throughout the week. Perhaps we are sauce hogs, but I didn't have anything resembling 4 cups of leftover sauce. These weren't quite as good as the ones from Italy, but on my first try I didn't expect them to be! They were still delicious and I loved the twist with the sweet potato. On a side note, this was part of a budget friendly section of the magazine, and they claim the whole dish costs $9.46, with the cost per serving being $2.37. 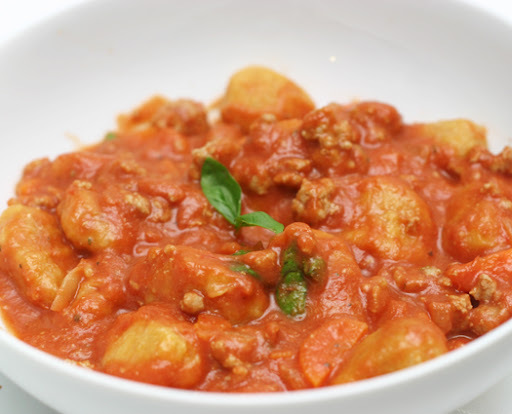 Traditionally, gnocchi is made with regular potatoes, while bolognese sauce can include whole milk or even cream. By using sweet potatoes, lean ground turkey and skim milk, we've not only taken some of the heft out of this dish, but we've also added a but more nutritional interest. 1. Preheat oven to 400 degrees F. Use a fork to poke holes in all potatoes. Bake on a cookie sheet, lined with foil, for 45 minutes. Remove potatoes from oven, let cool, remove skins and slice. Add potato sliced to a food processor fitted with a standard blade and puree for 3 minutes or until smooth. 2. To make gnocchi, put potato puree in a large bowl and mix in 2 cups flour, 1/4 cup at a time, (you will get a very sticky consistency). Dust hands with a bit of flour and form puree into teaspoon-sized oval shaped balls. You will periodically need to dust your hands with more flour while making balls. Once all balls are made (you will have 90 to 100), take a fork and, pressing lightly, made indentations around the circumference of the balls, being careful not to flatten them. Dust 2 plates or a cookie sheet with flour and place gnocchi on them to air dry so they will not be quite as fragile. 3. While gnocchi are drying, fill a large stockpot with water and bring to a boil over medium high eat. Once dry, add gnocchi to stockpot in small batches of about 10 to 15. When they float to the surface, after about 3 minutes, remove gnocchi with a slotted spoon. 4. To make sauce, heat a medium saucepot over medium high heat. Let heat for 1 minute, then mist with cooking spray. Add onion , celery, and carrots and saute for 3 to 4 minutes. Add turkey and stir, breaking meat up into pieces with a spoon or spatula as it cooks, about 5 minutes. 5. Once turkey is cooked, add remaining 2 tbsp of flour. Whisk in milk and stir until thickened. 6. Pour in tomatoes, tomato paste and 1/2 cup water. Reduce heat to medium low and stir. Add Italian seasoning and basil. Season with salt and pepper, if desired, and cook or another 5 minutes. 7. To serve, place 1 cup gnocchi in a bowl and top with 1 cup sauce. Garnish with additional basil, if desired. I love pizza and my husband loves white pizza, so I knew this would be great for us! However, I don't love arugula. In fact, I hate it. I have tried many times to like it to no avail. So we skipped the arugula and vinaigrette, and topped it with artichokes, red pepper, and kalamata olives instead! It was a beautiful weekend, and heating up the oven just seemed wrong so we cooked it on the grill. 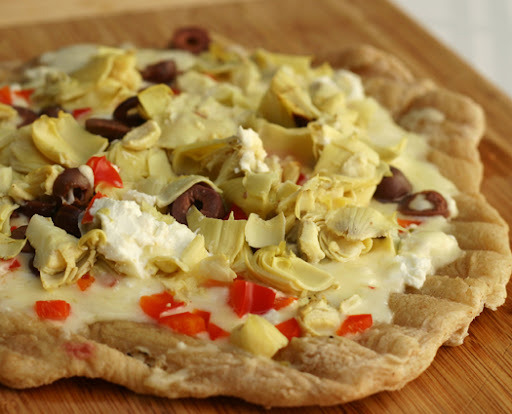 See how everyone else liked the pizza, over at Barefoot Bloggers. 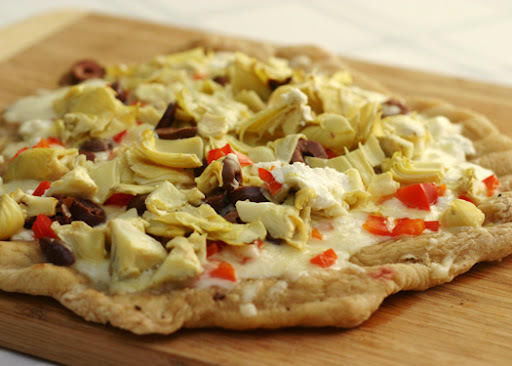 We added roasted artichoke hearts, chopped red bell pepper, and chopped kalamata olives! Place 1/2 cup of olive oil, the garlic, thyme and red pepper flakes in a small saucepan and bring to a simmer over low heat. Cook for 10 minutes, making sure the garlic doesn't burn. Set aside. Brush the pizzas with the garlic oil, and sprinkle each one liberally with salt and pepper. Sprinkle the pizzas evenly with fontina, mozzarella and goat cheese. Drizzle each pizza with 1 tablespoon more of the garlic oil and bake for 10 to 15 minutes, until the crusts are crisp and the cheeses begin to brown. Oh, I'm in love! 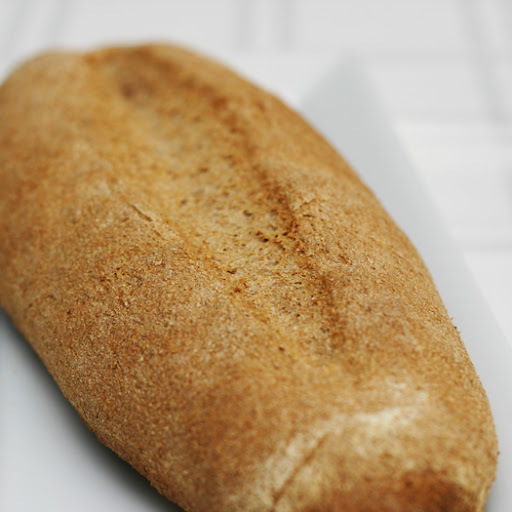 This is another whole wheat bread recipe from Peter Reinhart's book, and they are absolutely fabulous. I was getting tired of english muffins with my breakfast, so I couldn't wait to try making bagels. My only complaint is that the recipe only makes 6 to 7 bagels (I got 8). Between my husband and myself, we'll polish those off before the week is out! 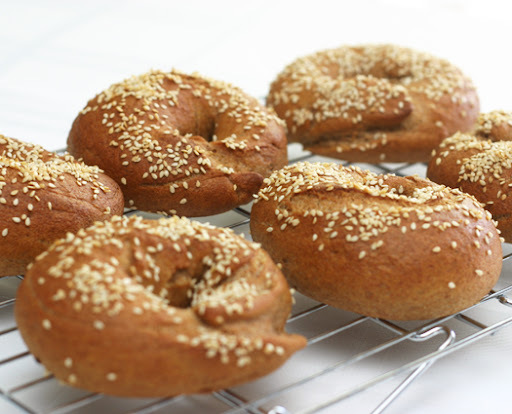 These involve a very similar pre-dough process to the whole wheat hearth bread recipe, but I think the bagels are fantastic and worth the wait! 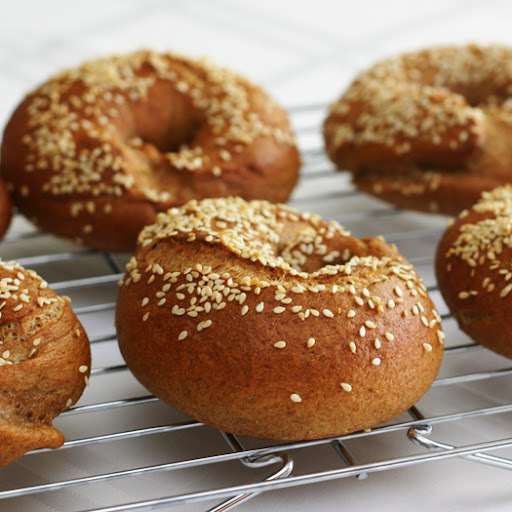 If you want to avoid the white flour in traditional bagel recipes, definitely give these a try! 2. By hand: Dissolve yeast in water in mixing bowl, then add biga, soaker, and salt and stir vigorously with a mixing spoon or knead with wet hands for about 3-4 minutes, until all ingredients are evenly integrated. Add the flour and knead for 2 more minutes, the dough should be firm but not sticky. If not, add more flour or water as needed. By stand mixer: Dissolve yeast in water in mixing bowl, then add biga, soaker, and salt and mix on low speed for one minute with hook. Add flour and mix on medium-low speed for 3-4 minutes until dough becomes cohesive and assimilated into each other. Add more flour or water as needed until the dough is firm and not sticky. This is a stiff dough, so turn the mixer off if necessary to avoid stressing the motor. 5. Transfer to lightly floured work surface and divide into 6 or 7 four ounce pieces (I managed to get 8). Roll each piece into an 8 inch rope, shape a circle around your hand. Sela tight at the point where the ends overlap by squeezing or pressing it into the counter. There should be a 2-inch diameter hole in the center. Place on prepared pan, cover loosely with a towel, leave at room temperature. The book claims these to be 25 calories. This has to be wrong so I will estimate the calories based on the macronutrients. So this was my first time jumping into the bread making pool. I heard that Peter Reinhart had a book out, based solely on whole wheat breads, and immediately looked it up in my library's catalog. They had it so I picked it up that day! 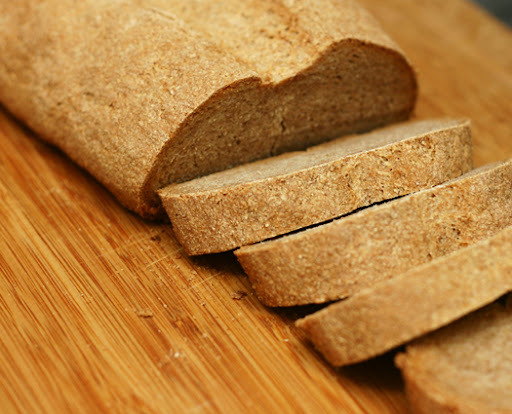 In my recent efforts to eat clean, I am staying away from white breads (not that I haven't anyway for last few years) and this book provides me with a plethora of homemade whole wheat bread options. This is one serious bread making book, and these recipes are involved. I see a lot of recipes that are... dump all ingredients together, rise, shape (and perhaps rise some more), bake. This is a little different. There are pre-doughs to be made, overnight waits, regular dough to be made, rising, shaping, more rising, then baking! Definitely a very involved process, but I couldn't wait to get started! I began with the whole wheat hearth bread because we were having sweet potato gnocchi and that seemed like the best thing to go with it. I added some agave nectar, but still think it could be more tender. There is certainly some room for improvement in my technique, but I think I'll go with the butter too, next time. 2. By hand: combine biga and soaker into a large bowl with all the remaining ingredients and stir vigorously with a mixing spoon or knead with wet hands for about 2 minutes, until all ingredients are evenly integrated. Dough should be soft and slightly sticky, if not, add more flour or water as needed. By stand mixer: combine biga and soaker with all the remaining ingredients into mixer bowl and mix on low speed for one minute with paddle (preferred) or hook. Switch to hook and mix on medium-low speed for 2-3 minutes until dough becomes cohesive and assimilated into each other. Add more flour or water as needed until the dough is soft and slightly sticky. 3. Dust a work surface with flour, the roll the dough in flour to coat. Knead by hand for 3 to 4 minutes, incorporating only as much flour as needed, until the dough feels soft and tacky, but not sticky. Form the dough into a ball and let it rest on the work surface for 5 minutes while you prepare a clean, lightly oiled bowl. 4. Resume kneading for 1 minutes to strengthen the gluten and make any final water/flour adjustments. Dough should have the strength to pass the windowpane test, but still be soft, supple, and very tacky. Form dough into a ball and place in prepared bowl, rolling to coat with oil. Cover loosely with plastic wrap and let rise at room temperature for approximately 45 to 60 minutes, until it is about 1.5 times its original size. 5. Transfer to lightly floured work surface. Form the dough into a boule, 2 to 4 batards or 4 mini baguettes, being careful to degas as little as possible while shaping. Place the boule onto a parchment lined baking sheet and mist the top with pan spray. Cover loosely with plastic wrap or a cloth towel and let rise at room temperature for approximately 45 minutes, until it is about 1.5 times its original size. 6. Preheat the oven to 500 degrees F with a baking stone inside; prepare for steam baking by placing a walled cookie sheet on the top rack and boiling some water. When the dough is ready to bake, place it in the oven and add 1 cup of hot water to the steam pan. Turn down the oven to 450 degrees F and bake for 20 minutes. Rotate the bread and continue baking 15 to 30 minutes more, until bread is a rich brown on all sides, sounds hollow when thumped on the bottom, and a thermometer inserted registers at least 200 degrees F. Remove from the oven and cool on a rack for at least one hour before serving. I am loving Clean Eating Magazine. I got my second issue recently and discovered a ton of recipes I couldn't wait to try. I loved the sound of the eggplant parmesan - it looked easy to make, didn't take that long, and actually had a great presentation. Best of all, it was delicious! I don't have bulgur, so I used couscous instead. 1. Preheat oven to 425 degrees F. Coat 2 rimmed baking sheets with cooking spray. Set aside. 2. Place egg whites in a shallow bowl. In another shallow bowl, combine panko, parmesan, oregano, garlic powder and salt. Trim ends off eggplants and cut each eggplant crosswise into six 3/4-inch slices. One at a time, dip eggplant slices in egg whites, then panko mixture, arranging coated slices on prepared baking sheets. 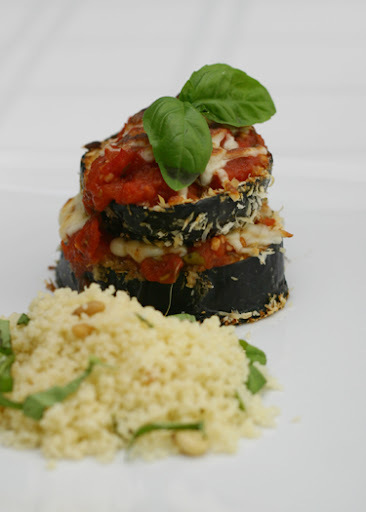 Bake until eggplant is tender and golden brown, about 25 minutes. 4. While eggplant is cooking and bulgur is softening, combine tomatoes, tomato paste, garlic and 8 basil leaves in a food processor and pulse to make a chunky sauce. Transfer to a small saucepan over medium heat. Bring to a boil, reduce to a simmer and cook, stirring occasionally, until sauce has thickened slightly, 8 to 10 minutes. 5. Remove eggplant from oven and preheat boiler. Arrange an oven rack about 8 inches from heating element. 6. Spoon tomato sauce over eggplant slices, dividing it evenly. Sprinkle mozzarella over tomato sauce, dividing it evenly. Use a spatula to place 6 eggplant slices on top of 6 others, making six 2-slice stacks on 1 baking sheet. Broil until mozzarella is browning on top and melted in the middle, about 3 minutes. 7. Meanwhile, chop or thinly slice remaining 4 basil leaves. Stir basil and pine nuts into bulgur. 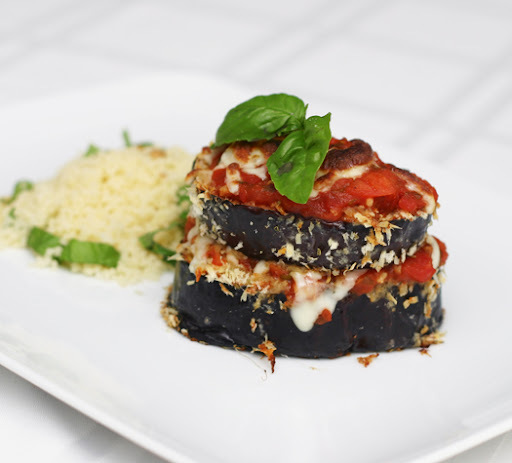 Serve alongside eggplant parmesan. 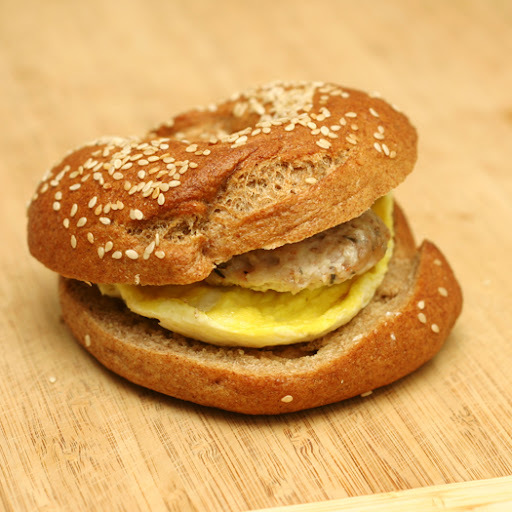 My favorite breakfast, as of late, is a whole wheat english muffin with an egg. I decided to add more protein to the dish with a chicken sausage patty. I looked around at a few different recipes and settled on a savory one from recipezaar for turkey sausage. The reviews said it was very spicy, so I cut back the black and cayenne pepper by half. With those amounts, I found it to be not at all spicy, so I might increase them for the next batch. I was pleasantly surprised to find that fresh boneless skinless chicken breasts, in place of the turkey, were easy to grind up in my mini food processor, and held together very well! 1. Combine all ingredients (use less pepper if you don't want a spicy taste) and blend well. If time permits, refrigerate overnight to let the meat absorb the flavor of the spices. 2. Form into patties. Heat a non-stick griddle or pan over medium heat. Spray pan with cooking spray. 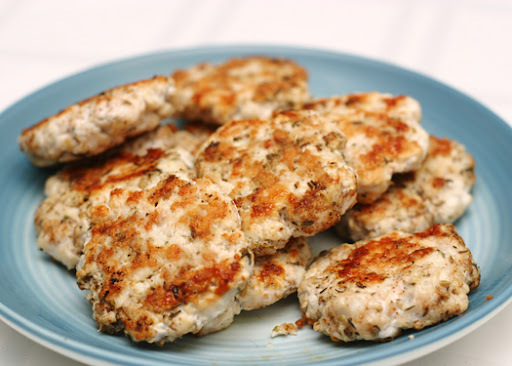 Add chicken patties and cook until brown on one side, about 5-10, then flip and cook through, about 5 minutes. Freeze leftovers. Don't overcook or they will dry out--remove from the heat as soon as they're no longer pink inside, but still juicy. (if you prefer a moister texture, you add a splash of olive oil or an egg to the mixture just prior to cooking). 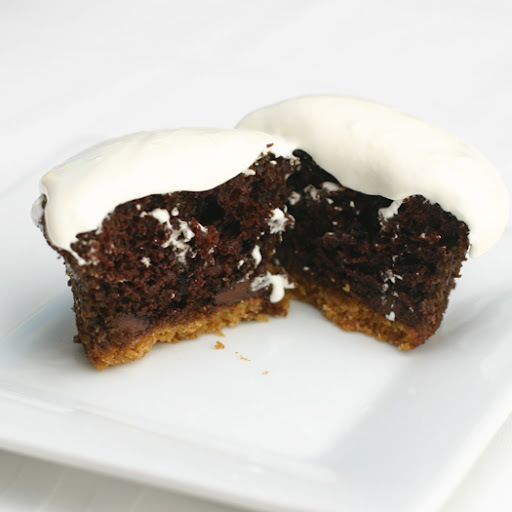 If you are looking for a cupcake to impress - this is your cupcake. 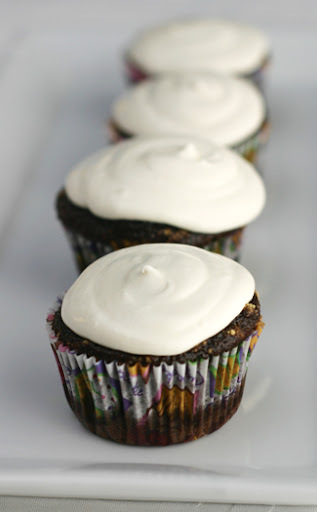 I made these for a party, and everyone was floored by them (they might have even beat out the oreo cupcakes!). These are some pretty outstanding cupcakes, for reasons that escape me still. It must be divine intervention because, well, these are divine! Even though it's a two step process, the cupcakes actually come together easily. My favorite part is the chocolate batter - after adding the water, it is actually pourable! I just loaded up my big measuring cup and poured the batter into the cupcake liners. So easy! I did end up having a problem with the frosting. I wanted a beautiful piped tower of marshmallow buttercream atop the cupcake, but I just couldn't get it stiff enough and ended up with marshmallow oozing down the sides. I suppose that is more true to form for a cupcake modeled after s'mores, and the party guests didn't seem to mind one bit. 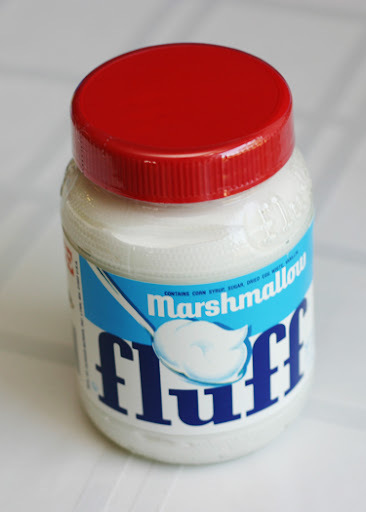 One final note, I pitty those that do not have access to marshmallow fluff. This stuff is heaven on top of a mug of hot chocolate in the winter! I didn't expect to see it out here in the midwest, but a local grocery store, through some miracle, had it in stock! 1. Heat oven to 350°F. Grease muffin cups or line with paper liners. 2. Combine 1/4 cup sugar,graham cracker crumbs and melted butter in a small bowl. Spoon 1 tablespoon of graham cracker mix into the bottom of each muffin cup. Press crumbs firmly, using the bottom of a small glass. Save the remaining mixture for topping. Top graham cracker mix with several bittersweet chocolate chips. 3. Bake graham mixture for about five minutes, or until the edges are golden brown. Remove from oven and set aside. 4. Stir together sugar, flour, cocoa, baking powder, baking soda and salt in medium bowl. 5. In a large bowl, combine eggs, milk, oil and vanilla. Stir until well blended. 6. Add flour mixture to large bowl and beat on medium speed of mixer 2 minutes. Stir in boiling water (batter will be thin). Pour batter into prepared pans. Fill prepared muffin cups 3/4 full with batter (about 1/4 cup). Sprinkle batter with small amount of remaining graham cracker mixture. 7. Bake 22 to 25 minutes. Cool completely, then frost. 1. Spoon the Marshmallow Fluff into a large bowl. Beat with an electric mixer on low. 2. Gradually add the butter pieces, beating well after each addition, until smooth. 3. Add the vanilla extract and the confectioner's sugar. Scrape the bowl well to incorporate. Add more confectioner's sugar, if necessary, to adjust the texture. Ok, ok. I grew up on chocolate chip cookies. 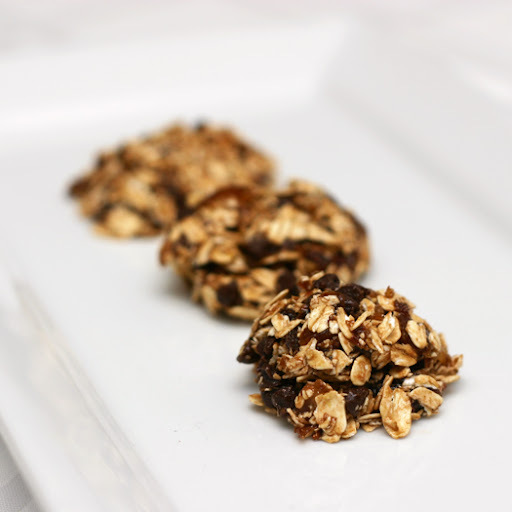 I know these aren't chocolate chip cookies, but they certainly make a fine substitute if you are trying to make better choices about your food! I saw this recipe in the September/October 2009 issue of Clean Eating magazine and thought they looked like minimal effort for a potentially sweet outcome (pun intended). There is no baking involved, making them a perfect treat for summer. In fact, I've even kept mine in the freezer. It helps them stay together and provides a cool snack. 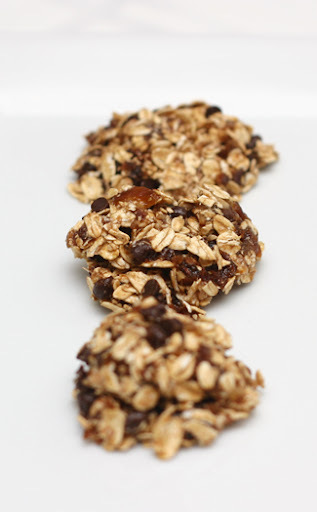 They are naturally sweetened by raisins and dates, with just a minimal amount of agave nectar or honey to hold the cookies together (on this first attempt, I think I was a little shy on the agave so mine didn't hold well unless I froze them). The cinnamon is a delight, waving hello to you from the background. I haven't had a chance to check out my local health food store for cacao nibs (has anyone ever seen those? ), so I just used mini chocolate morsels (definitely not clean, but it was all I had). You could probably also just use some squares of really dark chocolate, chopped fine. I think these would be good in a ball shape, formed with a cookie scoop for easy release onto a tray, then frozen. 1. Place raisins and dates in your food processor and chop into small pieces. Add oats, agave or honey, cinnamon and salt. Process to mix well. Empty into a mixing bowl and add cacao nibs. Mix well. 2. Use a tablespoon measure to portion cookies. Enjoy immediately, or chill before serving for firmer texture. Finally! A recipe for Barefoot Bloggers that calls for booze! This is a delicious new option for our summer adult beverage repertoire. 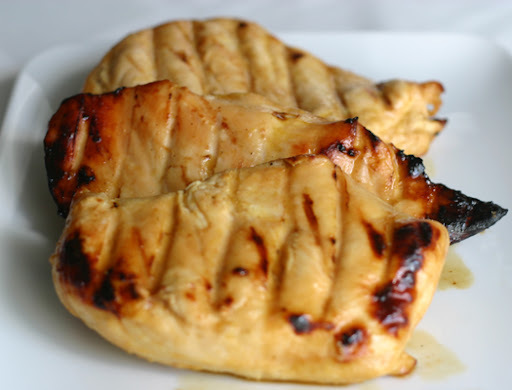 This recipe is a nice contrast to some of the other grilled chicken recipes I've tried lately. This one is simple. It doesn't even require fresh herbs, or marinating! Make a paste, slather it on the chicken, and grill. Easy! The flavors here are great, even with the dried herbs. 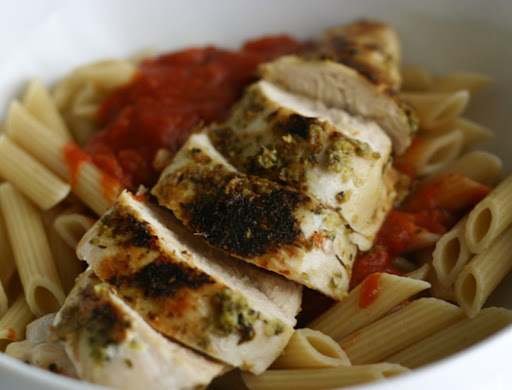 We found that pasta with a simple marinara paired quite well with this chicken. The only problem I saw was that there wasn't quite enough lemon/oregano to cover both sides of the 3 pieces of chicken that I cooked. I will definitely at least double those ingredients next time. Place each chicken breast half between 2 sheets of heavy-duty plastic wrap, and pound to 1/4-inch thickness using a meat mallet or rolling pin. Combine lemon rind and next 6 ingredients (through minced garlic); rub evenly over both sides of chicken. Place chicken on a grill rack coated with cooking spray, and grill 3 minutes on each side or until chicken is done. Remove from heat. Squeeze 1 lemon wedge evenly over each chicken breast half. Sprinkle parsley evenly over chicken. Doughnuts seem like one of those things that you can't skimp on. It falls in that category of - If you don't fry it, don't bother. I am never deterred by such claims because frying just doesn't appeal to me. It takes the fun out of things by making me and my kitchen smell... fried. Yuck. Heck, I don't even like pan frying anything, as seen in my search for a great crab cake. 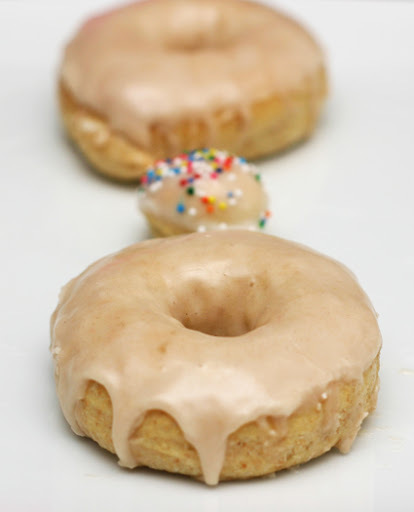 I've had this recipe for baked doughnuts bookmarked for quite some time now, and rediscovered it yesterday when I was organizing my saved recipes. I made a glaze with a cup or so of powdered sugar, 1/4 teaspoon vanilla extract, and enough milk until it was the consistency I wanted. After dipping a few doughnuts, I added cinnamon to the glaze. Yum! I like those doughnuts the best. 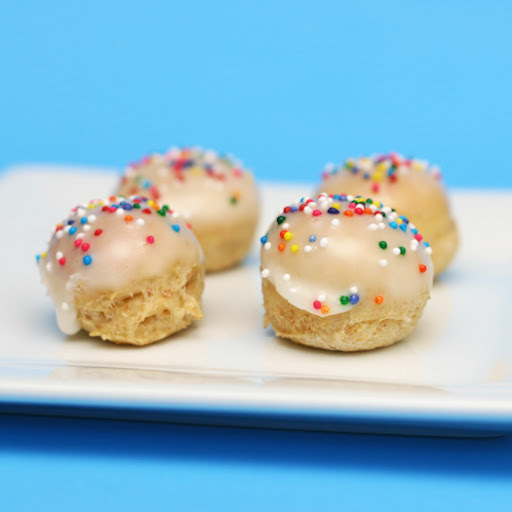 These certainly don't take the place of fried doughnuts, and the texture is somewhere between a cake doughnut and one of the really light and fluffy ones. True to form, I overbaked the first batch a bit (pulled them out at 8 minutes - I hate my oven sometimes!). Overall, not a bad treat! Don't over bake these, if anything, under bake them a bit - they will continue baking outside the oven for a few minutes. You want an interior that is moist and tender - not dry. 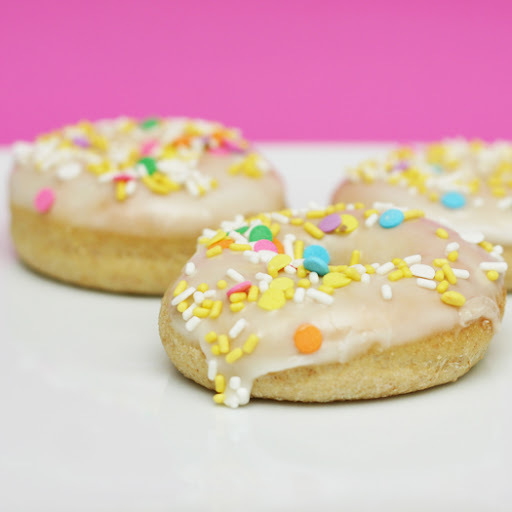 Also, be sure to cut big enough holes in the center of your doughnuts - too small and they will bake entirely shut. Remember they rise, and they rise even more when they are baking. These really need to be made-to-order, but you can make and shape the dough the night before if you want to serve them for brunch. Instructions: after shaping, place doughnuts on baking sheet, cover and place in the refrigerator overnight. Pull them out an hour before baking, and let rise in a warm place before baking. Place 1/3 cup of the warm milk in the bowl of an electric mixer. Stir in the yeast and set aside for five minutes or so. Be sure your milk isn't too hot or it will kill the yeast. Stir the butter and sugar into the remaining cup of warm milk and add it to the yeast mixture. With a fork, stir in the eggs, flour, nutmeg, and salt - just until the flour is incorporated. With the dough hook attachment of your mixer beat the dough for a few minutes at medium speed. This is where you are going to need to make adjustments - if your dough is overly sticky, add flour a few tablespoons at a time. Too dry? Add more milk a bit at a time. You want the dough to pull away from the sides of the mixing bowl and eventually become supple and smooth. Turn it out onto a floured counter-top, knead a few times (the dough should be barely sticky), and shape into a ball. Punch down the dough and roll it out 1/2-inch thick on your floured countertop. Most people (like myself) don't have a doughnut cutter, instead I use a 2-3 inch cookie cutter to stamp out circles. Transfer the circles to a parchment-lined baking sheet and stamp out the smaller inner circles using a smaller cutter. If you cut the inner holes out any earlier, they become distorted when you attempt to move them. Cover with a clean cloth and let rise for another 45 minutes. I love crab cakes. My husband does not. This makes me sad, as I never get the chance to make them at home. But, alas! My chance as come! He had to go out of town for work, so I sat down and mulled over all the crab cake recipes I've saved, just for this very occasion. The problem was, I couldn't just pick one. How would I know which one I liked best unless I made them all? And what better way to compare than to make them all at once? I am a huge fan of Bridget's comparison posts and figured this would be a great time to copy emulate her. I don't quite remember if I've ever made them at home before. I've certainly had a nice sampling from restaurants over the years, though. I love a nice coating on the outside... something to break into with your fork. Also, I like there to be something there besides the crab. I kind of like a little filler. Of course, I still want that crab flavor... just, enhanced. On the cooking side, I'd love a recipe that works well being baked. Also, how well it holds together is important. For sauce, I made a fantastic Paule Deen remoulade once but lost the recipe. The one I used here is all I could find of hers, but I don't think it's the right one. Anyway, this one is pretty good, and I used 2% greek yogurt in place of the mayonnaise. 1. Christine of Chronicles of a Fledgling Cook. I've had this recipe printed out and in my recipe box for years. Figured it was about time I made it! 2. Ellie Krieger of the Food Network. I definitely wanted to throw one in there from someone who stance is healthful food. 3. Cook's Illustrated. They seem to know what they are doing, right? 4. Katie of Good Things Catered. I've been drooling over hers since January! I will warn you now - this experience was a true testament to the name at the top of this page. I have zero flipping skills, especially when it comes to delicate items. I am moderately embarrassed by the unfortunate demise of half these cakes, but hey - it's just me at home today. When I make them for company, I will be that much the wiser. I only made one minor ingredient adjustment. I (really, really) don't care for fresh parsley, so I used cilantro in the three recipes that called for it. Also, I see no issue with using canned jumbo lump crab meat. Cook's Illustrated gave their blessing on that front, so that was enough for me. (Plus, I live in the midwest. Any "fresh" fish scares me!). 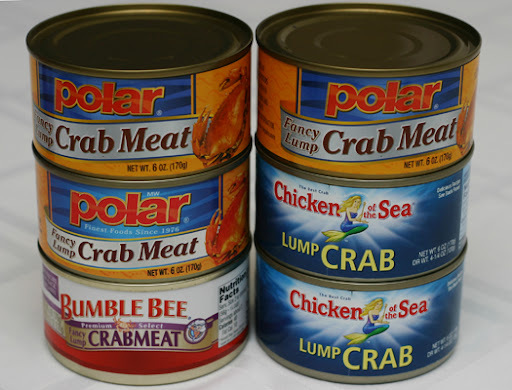 One note about the canned crab - only got roughly 3.5 ounces of crab from each 6 ounce can, so plan accordingly! Also, all the cakes were chilled for 2 hours before cooking. 1. Christine's recipe (actually an adaptation of a Paula Deen recipe) requires the most prepwork. red pepper, garlic, and shallots are sauteed before being combined with the other filler ingredients, then folded into the crab meat. I found the filler to be more of a paste, which was difficult to blend into the crab without overworking. Later I realized I didn't use the proper amount of egg, so that probably affected the mixing. It didn't seem to hold together well while handling, which made it difficult to coat with the cheese/bread crumbs mixture. Ultimately it was the easiest recipe to flip in the pan, holding together very well where it counts. 2. 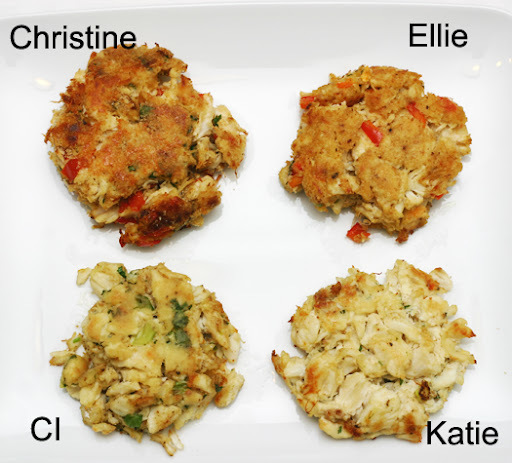 For Ellie's recipe, the filler ingredients are combined in a bowl, then added to the crab. Bread crumbs are added last, then the cakes are coated in breadcrumbs. This didn't hold together well, either. The pan frying was a disaster, it completely fell apart!! Flipping was a disaster. The baked cake was easier to flip, I think because since it's baked, the whole cake is cooking instead of just one side when pan frying. 3. The CI recipe threw everything together except the egg, which was folded in last. It had a good moisture level and held together better than the others before going into the fridge, but then was hard to dredge in the flour before cooking. The recipe is a little confusing, it calls for ground black pepper in the ingredient list, but the directions call for white pepper. I only have black, so that's what I used. This was another flipping disaster! And, like Ellie's, it fared better in the oven. I probably should have used more breadcrumbs, as the recipe instructs you to do if it isn't holding well. 4. Katie's recipe was had the best moisture level, not surprising with the bread soaked in milk. The directions didn't say what to do with the bread when adding it to the crab, so I just tore it into pieces before throwing it in. It seemed to hold together the best pre-chilling. While cooking, it was the second easiest to flip. 1. 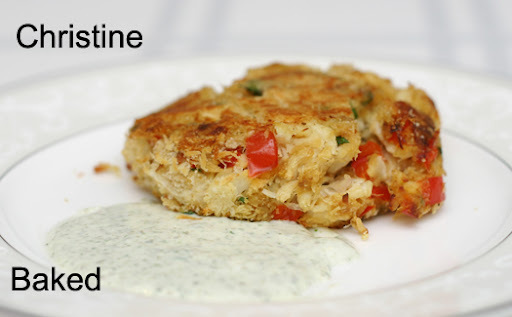 I loved the flavor of the red pepper in Christine's crab cakes, but I was missing something important - the crab! At first I thought that I had just chosen the wrong weekend to make these, as I have come down with a cold and my taste buds are sleeping. But after trying the other recipes, I realized that this recipe just falls flat. It takes the most work, and while it holds together the best, it just didn't work for me. 2. Ellie's recipe also had the great flavor from the red pepper. The hot sauce gave it a great, subtle kick in the background that complemented the other flavors. The crab flavor finally surfaced here, though it was not as strong as the next two recipes. The baked cake had a nice crunchy coating, but the pan fried cake completely fell apart during cooking. This one was my overall favorite. It is perfect for baking, had a moderate level of crab flavor with great complementary flavors. 3. When I got to the CI recipe, the first without red pepper, I expected to miss that flavor since I loved it so much in the first two. That was not the case at all! The crab flavor really came out in this one, accented by the green onion. Also, this cake had that certain je ne sais quoi that only mayonnaise can provide. However, I had a problem keeping it together while flipping in the pan. 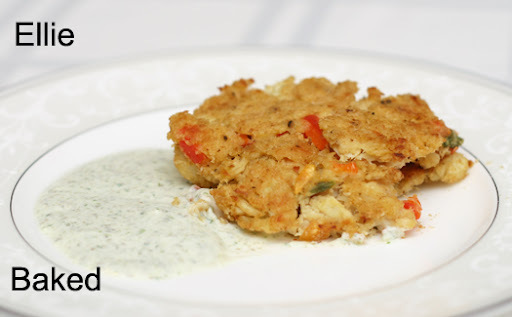 If you love crab cakes that really give great crab flavor and a hint of onion, this is a good recipe to try. Hopefully everyone else is better at flipping than I am! 4. My notes on Katie's recipe start with "pure, unadulterated crab." 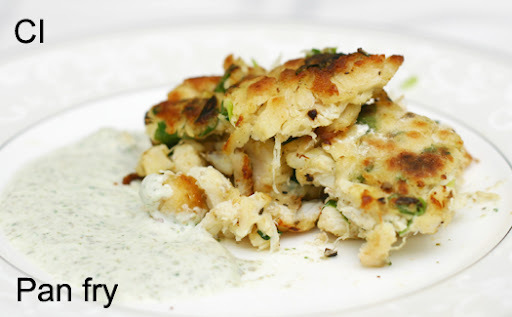 This is a great recipe if you have fantastic, fresh crab and love to let it shine. It held together better in the pan than it fared in the oven. Perhaps because it was the 4th one I flipped, I started to get better at being gentle. It's very similar to the CI recipe in terms of flavor, really just without the green onion. So if you love letting the real crab flavor shine, this is a fantastic choice. My personal favorite is Ellie's recipe. I love the flavors and that it can be baked, holding together reasonably well. With practice I think I will improve upon that. For real crab loving company, if I can get my hands on some fresh crab, I'll probably make Katie's recipe and pan fry, since it was easier to work with than the CI recipe. If the CI recipe held together better (perhaps by following the directions? ), it would also be a good choice for those without aversion to onions. -Melt 1 tablespoon of butter in a saute pan over medium heat. Saute the shallot, pepper, and garlic until the pepper is limp, about 2-3 minutes. Remove from heat and add the cream, mustard, 1 egg, parsley, old bay and 1/4 cup bread crumbs. Mix well and then gently fold in the crab meat. Form the mixture into 4 cakes, about 1/2-inch thick. -In a separate mixing bowl, combine the remaining 1/4 cup of bread crumbs with the Parmesan. Pat this topping onto both sides of the cakes. Place cakes on a plate, cover with plastic wrap and refrigerate until firm, at least 2 hours. -In a medium skillet, combine more oil and butter (about a tbl of each) over medium heat. 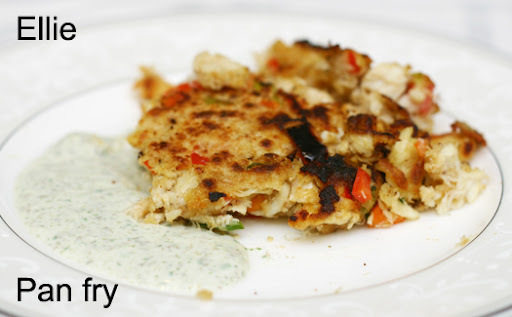 Saute the crab cakes approximately 3 minutes on each side or until golden brown. Source: Ellie Krieger of the Food Network. -Preheat the oven to 400 degrees F. Coat a baking sheet with nonstick cooking spray. -In a medium bowl mix together the egg, mustard, Worcestershire sauce, lemon juice, Old Bay seasoning and hot sauce. Stir in the bell pepper and scallion. Gently fold in the crab, 1/4 cup of the bread crumbs and salt and pepper to taste. Put the remaining bread rumbs in a shallow dish. -Divide the crab mixture into 8 mounds. Shape 1 mound into a round and coat in bread crumbs. 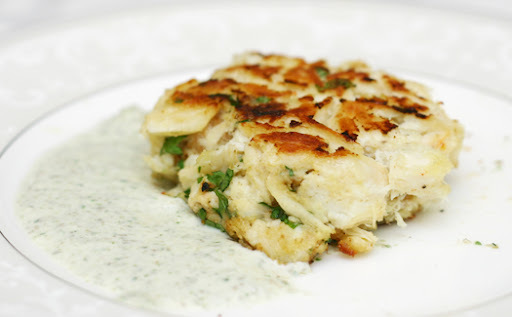 Transfer to the prepared baking sheet and flatten the crab cake to form a patty about 1-inch high. 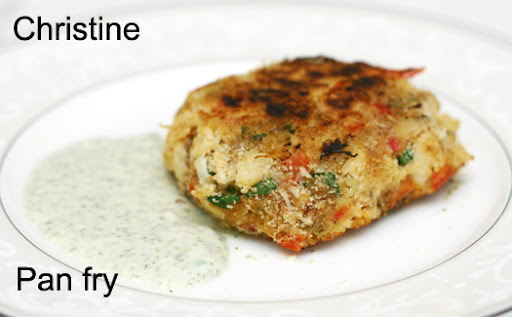 Repeat to form the remaining crab cakes. -Bake until golden on the bottom, about 10 minutes. 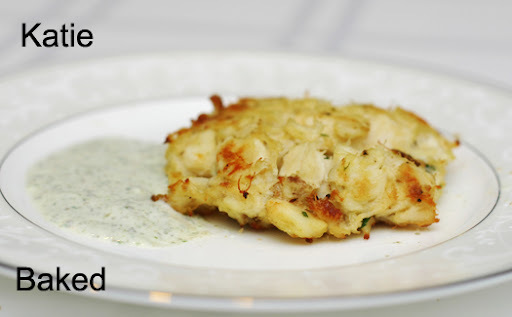 Gently flip the crab cakes and cook until the second side is golden, 5 to 10 minutes longer. 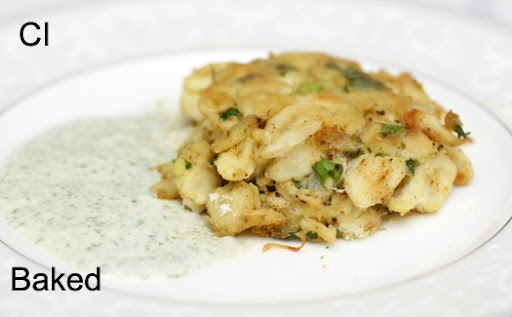 The amount of bread crumbs you add will depend on the moistness of the crabmeat. Start with the smallest amount, adjust the seasonings, then add the egg. If the cakes won't bind at this point, add more bread crumbs, 1 tablespoon at a time. If you can't find fresh jumbo lump crabmeat, pasteurized crabmeat, though not as good, is a decent substitute. 1. 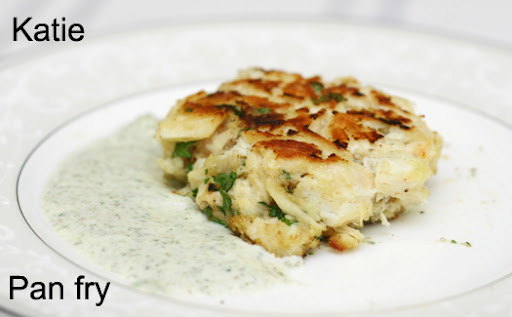 Gently mix the crabmeat, scallions, herb, Old Bay, 2 tablespoons bread crumbs, and mayonnaise in a medium bowl, being careful not to break up the lumps of crab. Season with salt and white pepper to taste. Carefully fold in the egg with a rubber spatula until the mixture just clings together. Add more crumbs if necessary. 3. Put the flour on a plate or in a pie tin. Lightly dredge the crab cakes in the flour. Heat the oil in a large, preferably nonstick skillet over medium-high heat until hot but not smoking. 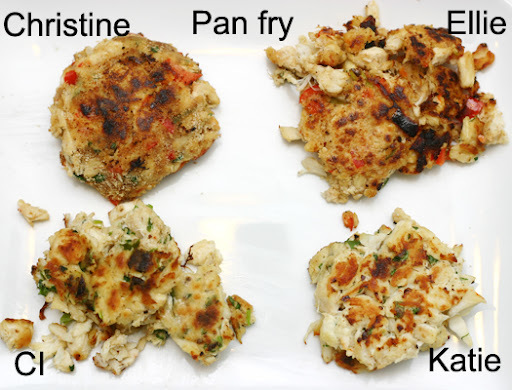 Gently place chilled crab cakes in the skillet; pan-fry until the outsides are crisp and browned, 4 to 5 minutes per side. Serve immediately with lemon wedges or dipping sauce. -In large bowl, combine crab, egg, mayo, bread, 1 tsp old bay (or more if desired), salt, pepper, parsley and mix to combine thoroughly. -Pat into 4 inch cakes and place into fridge to set for 20-30 minutes. -In medium fry pan, add oil and heat over medium low heat until almost smoking. -Place cakes into pan carefully, making sure not to break, and let pan fry until golden brown, about 8-10 minutes. -Carefully flip cakes and let pan fry until other side is golden brown, about 5-8 minutes more. -Carefully remove cakes from the pan and place on paper towel lined plate. 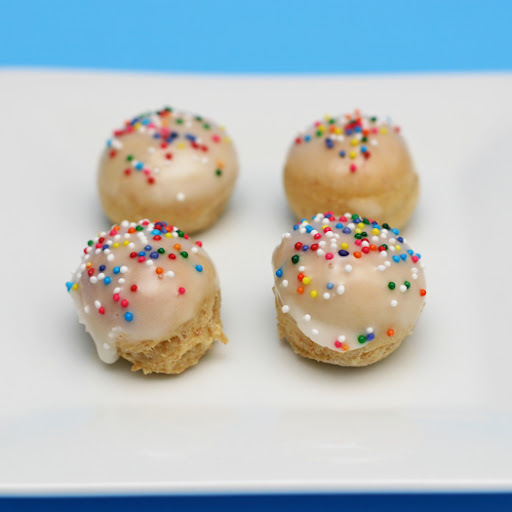 -Sprinkle tops of cakes with old bay and serve immediately. To prepare sauce, place the parsley, green onions, capers, and garlic in a blender or food processor and combine. Add the mayonnaise, olive oil, lemon juice and mustard. Blend well. Chill until ready to serve with seafood. This keeps in a covered container in the refrigerator for several weeks. This recipe is a little more work that I am used to for a marinade. I typically like the easy throw-together-a-few-ingredients kind. I saw this one from Cooking Light and I thought I'd see if it was worth the extra trouble. We loved this recipe and I definitely thought it was better than any other tequila based marinade I've made before. It's definitely worth the extra work! To prepare the marinade, heat oil in a nonstick skillet over medium-high heat. Add onion and garlic; sauté for 3 minutes. Add jalapeño peppers and oranges; cook for 2 minutes, stirring occasionally. Add juice; cook 2 minutes. Add tequila; cook 3 minutes. Add rosemary, cilantro, and vinegar; cook 1 minute. 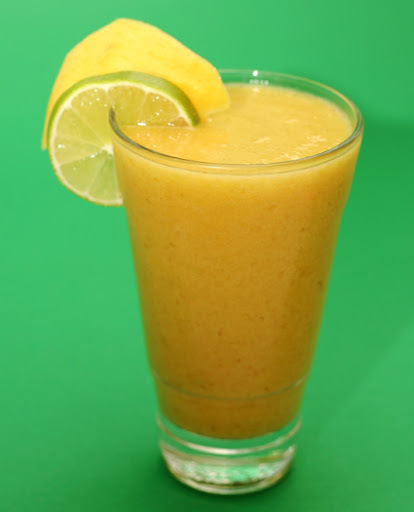 Place marinade in a blender or food processor; process until smooth. Strain the mixture through a sieve into a bowl. Discard solids. Reserve 1/2 cup marinade. Place remaining marinade in a large zip-top plastic bag. To prepare the chicken, pierce with a fork. Add the chicken, chili powder, salt, and pepper to marinade in bag. Seal and marinate in refrigerator 2 hours, turning bag occasionally. Remove the chicken from bag; discard marinade. Place the chicken on grill rack coated with cooking spray; cook 12 minutes on each side or until chicken is done, basting frequently with reserved marinade. Note: For chicken pieces, use a combination of chicken breasts, thighs, and drumsticks. Look for packages labeled "pick of the chick" in the butcher case. I was being lazy and didn't feel like going to the grocery store over the weekend, so I needed a good new grilling recipe that I could make with what I had on hand. I went off to peruse grilled chicken recipes from Cooking Light and found quite a few that fit the bill! I just spent a week traveling for work, so the recipe that called for bourbon floated right to the top of the list. This recipe calls for a quick one hour marinade, which I like. My chicken breasts were already thin, so no pounding was necessary and they still grilled up quickly. The chicken by itself was just ok, but adding the reserved marinade-turned sauce really made the dish. It was awesome! The whiskey gave a nice base, and the ginger and lime peeked through. 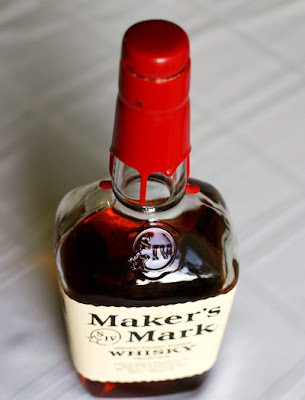 Combine bourbon and next 9 ingredients (bourbon through garlic). Reserve 1/3 cup marinade. Pour remaining marinade into a zip-top plastic bag; add chicken. Seal and marinate in refrigerator 1 hour, turning occasionally. Preheat grill to medium-hot using both burners. Combine water and cornstarch, stirring well with a whisk. Place reserved 1/3 cup marinade in a small saucepan; stir in cornstarch mixture. Bring to a boil; cook 15 seconds, stirring constantly. 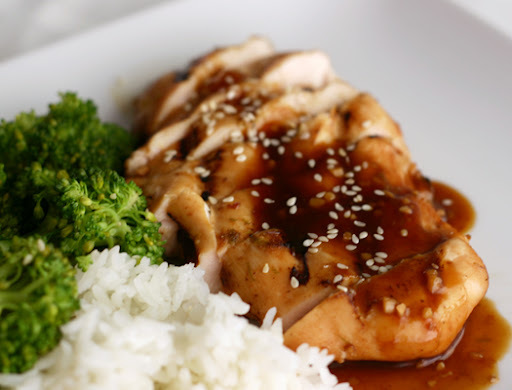 Drizzle sauce over chicken; sprinkle with sesame seeds.